Some years ago I remember watching a television documentary about the English artist Ben Nicholson. At one point, speaking about a particular series of paintings in which Nicholson had arranged some carpentry tools in various geometric patterns, one of the commentators made what is, I suppose, an obvious but also an illuminating observation: the primary challenge for a painter is working out how to divide up the two-dimensional plane of the canvas—or, like the painter in Anthony Hecht’s poem, “Devotions of a Painter”, one could say “getting as much truth as can be managed/ Onto a small flat canvas”. 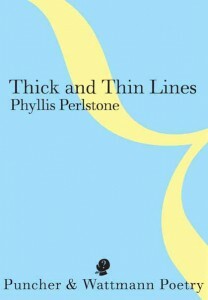 I was reminded of this while reading Phyllis Perlstone’s new collection, Thick and Thin Lines. 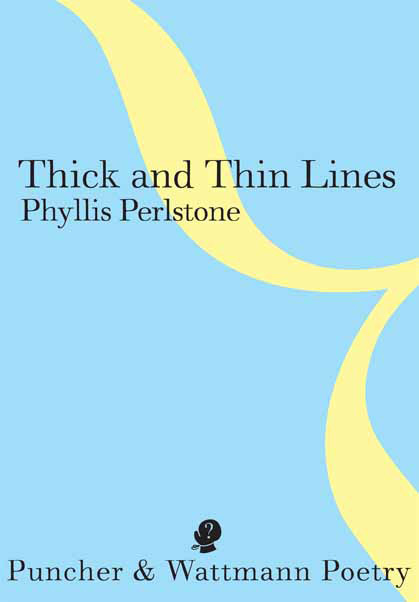 Perlstone, as some readers may know, began as a painter and everywhere in her poems you can see the painter’s eye looking, analysing the fall of light, the disposition and changing patterns of objects, persons and events on the plane of the observed world. “Dangling their copies”—a wonderfully evocative phrase. It is as though she is not simply looking at and describing what is before her eyes, but analysing it into its component pieces and putting it back together again—composing it. “Looking is such a marvellous thing,” Rilke said, “of which we know little; as we look, we are directed wholly outside ourselves.” The descriptive is never merely descriptive; it can lead to discoveries. Or as Matisse put it, “To see is itself a creative operation, requiring effort.” In Perlstone’s poems we are constantly aware of that creative effort of the observing mind, almost as though the continued existence of the world depends on it. A passage from Russell Hoban’s novel Fremder comes to mind: “Holding on to the world is mostly an act of faith: you see a little bit of it in front of you and you believe in the rest of it both in time and space.” This somewhat provisional nature of the world’s reality seems to be present in some of Perlstone’s poems too. Note that “real” in inverted commas. But, despite the truth of Rilke’s remark, the mind looks in as well as out and it quickly becomes apparent that much of what is going on in this book is the mind’s probing of its own practices, its doubts and uncertainties, and that the finely described scenes of the outside world, always moving and changing, are in conversation with the emotional and intellectual dramas of the poet’s inner life. She speaks of “the airiness/ that is either happiness or weather”. Observation is a permeable membrane. The world flows through into the mind, and the mind flows out into the world. If I may be permitted to quote from my blurb for Perlstone’s last book, The Edge of Everything, “Where does the self end and the world begin? Perlstone is both enraptured and disturbed by the endless process of existence, engaged and estranged by what the light pins down for our contemplation.” These remarks are equally relevant to the new book. So in “Red lights” the return of light and colour in the morning also reveals “the photo of the mother as a child” that “makes her own child sad” and “imparts a memory this child can’t ever have”. The light of day seems to shine not only into the interior of the house but into the perspectives of memory. These thresholds and portals do not lead exclusively to the realm of the personal. At times poems open out, suddenly and startlingly, onto subjects of historical scope. In “The Yarra and Arendt’s Centenary” the opening view of the calm river and scullers skimming across its surface forms an opposing counterpart to the poet’s “reflected/ stream of consciousness”, which is obsessed with the horrors of the age, from Eichmann through to the more recent follies of Rumsfeld and Cheney. In “Power unconfined”, the sight of an ocean liner in the harbour, and its queue of passengers taking their turn “with the orders of the day”, leads to contemplation of the power that draws the ship’s vast bulk “to where it will be out of sight”, and confronts us finally with images of the ship St Louis and its Jewish refugees, of the Tampa and the SIEV X.
I like the rather dry wit of the book’s title, Thick and Thin Lines. At first glance this seems a rather bald and uninformative phrase, but the motif proves to be surprisingly productive. We find lines of light and shadow, lines of bodies and buildings (“a line of bricks confining space by design”), lines of music (“thinner than a thin flute’s/sound”), lines, of course, of thought (“the stem-line of your thinking”, as one poem has it), lines of action and unfolding experience, lines of division and connection. “I’m talking”, she says at the end of the opening poem, “to slow my reading down/into where I hold/nearness/in a line of work”. A later poem concludes, “In late sun he’s a measure of lines only/The louvres’ pleating patterns/contain him”. The lines in fact end up containing a great deal. Now she might have said “inadequate light” or “insufficient light”, but the not-enough light is curiously effective. The same poem provides “the out-to-sea waves”. Elsewhere we find “lost-on-the-horizon birds-wings” and “my down-on-earth life”. Thick and Thin Lines is by turns beautiful, thought-provoking, unsettling, moving—and quite original. Now it is possible to make a fetish of originality. Sometimes it turns out to be nothing more than transient novelty. True originality, though, like happiness, is not really something you can pursue and capture directly; it is in fact a by-product of excellence, of the search for the vivid and memorable expression of a unique vision. And that, I think, is what Phyllis Perlstone achieves in Thick and Thin Lines. STEPHEN EDGAR is a Sydney poet. He received the Grace Leven Prize, the Philip Hodgins Medal; his latest collections are Eldershaw and The Red Sea.